Every now and then a wave of synchronicity flows through the corridors of power in Hollywood, resulting in competing films with the same basic subject matter released within a few months of each other. Hence, dual films about crashing asteroids (DEEP IMPACT and ARMAGEDDON), Robin Hood (although Fox blinked and sent its Patrick Begin starring ROBIN HOOD to TV to avoid competing with ROBIN HOOD: PRINCE OF THIEVES) and this years Snow White inspired MIRROR MIRROR and SNOW WHITE AND THE HUNTSMAN. 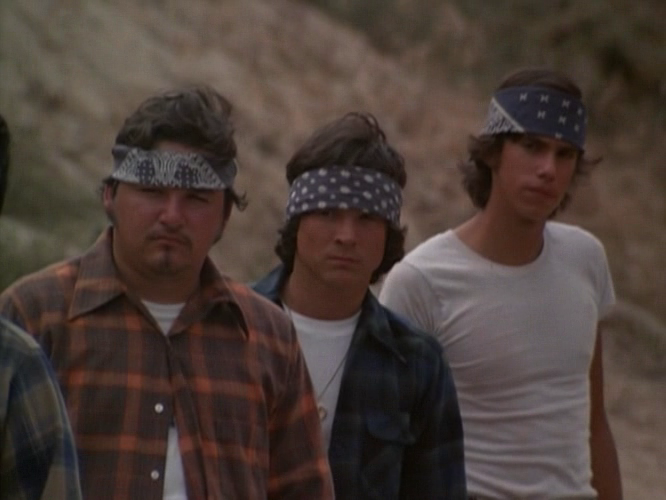 In 1979 the hot topic was street gangs, with no less than four films dealing with the subject. At the top of the heap is Walter Hill's THE WARRIORS along with the seldom seen BOULEVARD NIGHTS and SUNNYSIDE, starring John Travolta's talent-impaired brother Joey. 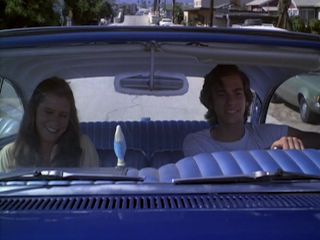 Rounding out the quartet is the oddest film in the bunch, Robert L. Collins' WALK PROUD, which won instant admission into the Camp Hall of Fame due to its casting of the very white teen heartthrob Robby Benson as a Chicano gang leader. Benson, complete with brown contacts, bandanna and what looks like shoe polish smeared all over his body, plays Emilio, second in command of the Aztecas, the toughest gang in Venice, California. In fact, the Aztecas are so tough that they are able to intimidate a robbery witness by staring him down through the reflective side of a two way mirror. However Emilio starts to question his loyalties to the gang when he falls for Sarah (Sarah Holcomb), a wealthy girl from his school. Thus begins not only a tender love story but a meeting of two cultures as Emilio lectures Sarah on Chicano pride with Elton John songs playing in the background (since nothing says Chicano pride like Elton John) and Sarah introduces Emilio to her parents while on an outing on their boat (since all white parents are wealthy enough to own boats yet still send their daughters to schools populated by gang members). It's not long before Emilio's divided loyalties run the risk of having him "jumped out" of the gang, a process that may leave him friendless and physically broken. By all rights this movie should be terrible and it is laughable in a lot of ways, but everyone involved seems so earnest that it becomes possible to ignore some of the more ridiculous aspects of the story. It's true that Benson is terribly miscast but he tries really, really hard to pull it off and almost succeeds. It helps that he's surrounded by actual Chicano character actors like Pepe Serna and Trinadad Silva who try their best to make Benson look authentic. Benson even sings the film's end credit theme song, "Adios Yesterday" (with lyrics written by his father, Jerry Segal). He also has extremely nice chemistry with Holcomb, a promising young actress who should've had a much bigger career but ended up a Hollywood casualty after supporting parts in ANIMAL HOUSE and CADDYSHACK. Her sad story can be found here. Most of the film's faults can be attributed to the weak script by veteran novelist Evan Hunter and Collins' direction. Collins shoots the movie in a very flat, uninteresting way which makes it look like a made for TV film, not surprisingly since most of his experience is in television. By far the mildest of all the 1979 gang films in terms of its depiction of gang violence, WALK PROUD is much more successful as a romance than a gang movie. That should have worked in the film's favor when THE WARRIORS and its ilk were pulled from theaters following reports of increased violence and vandalism at theaters where they were playing. But instead of marketing it as a romance Universal pulled the film, making it very hard to see prior to its VHS release and adding to its terrible reputation. In truth, the film is no better or worse than dozens of other teen romantic dramas made at the time (many of which starred Benson). It's by no means a great (or even very good) movie but there are much worse ways to spend a lazy afternoon. For more overlooked film and AV check out Todd Mason's blog. Don't forget The Wanderers. That came out around the same time as The Warriors. Thanks Todd. Mike, I don't know how I overlooked THE WANDERERS since I really love that film. I'm glad Brian was there to correct my mistake! Thanks for the shout-out, guys! It really is strange how several films can be released simultaneously with such similar themes. I'm reminded of the 4 "body switching" comedies of 1988: Big, Like Father Like Son, 18 Again, and Vice Versa. Only Big being worth its salt (although 18 Again had its charms).